This month’s Google Adsense Cheque had cool gift of Google +1 Stickers in the envelope. It was a nice surprise as I eagerly opened the Google Adsense cheque to find 5 high quality Google +1 Stickers. Last year Google had sent us an Adsense sticker which we shared with you, but this is even better! Google +1 buttons are getting popular and you see the +1 buttons all across the web as webmasters get visitors to +1 their content. These +1 stickers are really amazing and thank you Google. This is a great way for offline promotion. Google has previously sent holiday gifts to top publishers like Digital photo frames, USB memory cards, mini fridges, wireless mouse kits, flip video camcorders, lava lamps, marketing toolkits, and laptop bags. Now these 5 stickers I will put to good use. 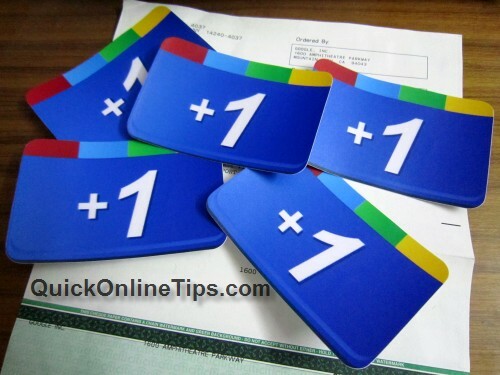 Did you get Google plus one stickers with your Adsense cheque? Post a comment. Update: Google Adsense followed this up with an email titled “Look inside your AdSense payment envelope for +1 stickers”. Dear Publisher, As a token of our appreciation of your continued participation in the Google AdSense programme, we have sent you a couple of +1 stickers in the envelope with your AdSense earnings this month. You can sport them on your laptops, and even share them with your friends!